Switchboard installation, design, upgrades and repairs. 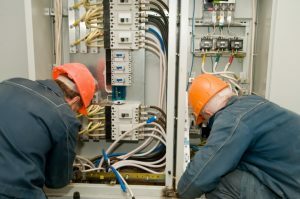 Looking for an experienced switchboard electrician to repair your current switchboard or fuse box? Or do you need business or home electrical switchboard design? or for us to install a new electrical switchboard? 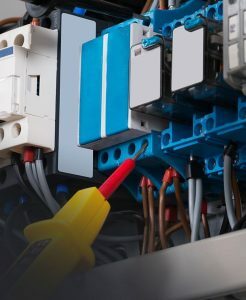 Voltfix offers exceptional switchboard services in and around Brisbane, Logan and Redlands in Australia. Our team understands the importance of keeping your home and the people you care about safe. A top priority in home safety is ensuring the electrical wiring of your home or commercial space is functioning at its best. Just like you bring your car to the mechanic for regular servicing, it is equally important to assess and service your switchboard every 18 months. Old house switchboards pose a higher risk for fire and offer less protection against receiving an electric shock. Also, appliances have changed dramatically in the last 50 years. You cannot expect an old household switchboard to safely handle the powerload of modern technology. Repairing old panels is sometimes possible, however often these outdated switchboards need to be replaced. Upgrading to a new panel with circuit breakers and safety switches protects the existing circuits of your home. Moreover, when a fault occurs with a modern switchboard panel, it is located much faster, in as little as 30 milliseconds or less. Overall modern switchboards are smaller, more reliable, and safer. Contact us for domestic switchboard installation, repair, design or upgrades. We help clients protect their business by ensuring their electrical demands are met without costly interruptions. Not only do outdated switchboards pose fire risks, there is also the risk of losing out on potential business because of a sudden loss of electricity. Most equipment can’t be operated without electricity, so it is paramount you know your switchboard can handle the current load. Why upgrade or replace an old switchboard? Outdated porcelain fuse boards often cannot cope with the demands of modern electrical applications and technology. New circuit breakers and safety switches protect your home’s existing circuits. Contact us today for a commercial or home switchboard upgrade or to design, replace or install your switchboard.